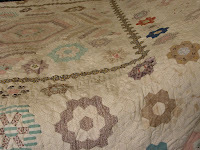 In patchwork, foundation piecing was originally a method used to stabilize pieces of fabric that were stitched together. It first became popular in the 18th and 19th centuries in England, although a 15th-century Italian piece, the Impruneta cushion owned by Antonio degli Agli , may have used foundation piecing. It is sometimes referred to as English paper piecing because of its popularity in Britain. Originally pieces of scrap fabric or muslin were used as the foundation. Recently, the use of paper, whether tracing paper, freezer paper or some other heavyweight paper, has become very popular for use as a pattern, in creating quilt blocks that are all the same size, each with precise, sharp points and perfectly matched intersections. In addition, information such as colour and fabric choices can be written on the paper foundation in order to facilitate the construction of the piece and reducing room for error while sewing. The picture on the right is a beautiful example of paper piecing and this quilt is at Arlington Court.... just look what can be achieved. 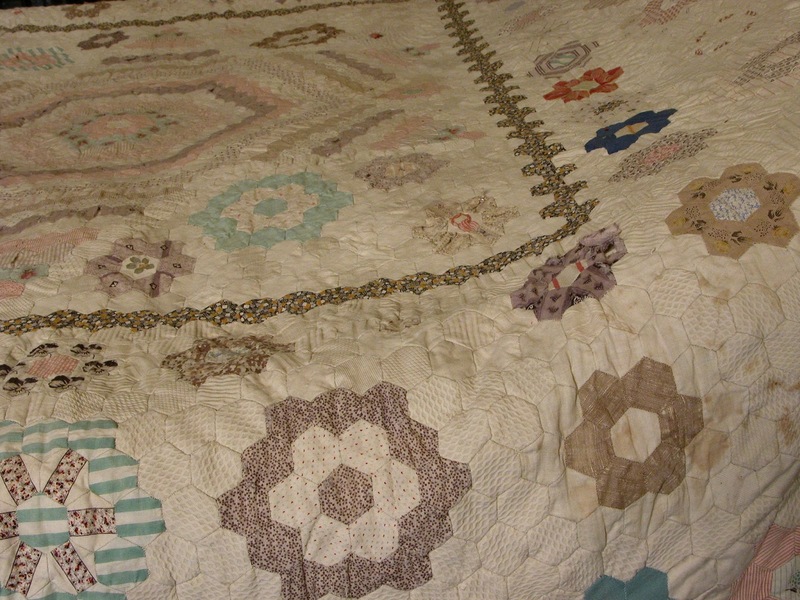 This is a great way to patchwork and can look so beautiful. 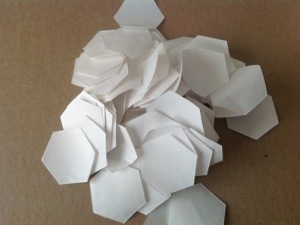 You can now buy pieces of already cut papers in hexagonal shapes as well as squares and other shapes. You can re-use the papers a few times as well and I feel this is the best use of time and economical way of doing it. They are accurate as well and saves drawing and cutting them out or printing pages of them and cutting them out, this is all done for you in packs and they come in packs of 100 or more. All you need to do is put pin a shape of paper to some fabric and cut around it, leaving a 1/4 inch seam. Then you fold your seam around the paper by finger pressing and you secure it using a hand tacking stitch. Once you have a few of these done you join them by sewing them right sides together using a small whipped stitch. Eventually the tacking stitch is pulled out and you remove the papers. You then just treat it like any other quilt and put wadding in the middle with backing and binding. I am, as you see doing a little flower shape to put onto my Homespun banner as I thought it would look lovely. I want the banner to have a slight sampler effect in a way with the company name of course so it has been a challenge and fun designing this project. I however did not get much done over the weekend at all as on Friday evening we had friends for dinner and another set of friends for lunch on Saturday and it has been the cooking and cleaning up of that as much as spending time with my husband who works such long hours in the week that weekends count for us. If he wants to get on with some DIY or car cleaning then that is my chance to pick up a needle ....other than that we do things together. Have a great day and of course as always Happy Stitching! Vintage fabric packs of inspiration! Dig For Victory ...... 1940's week! Make Do And Mend ....This is 1940's Week! Today we talk needles for embroidery and more!